Dr. Vasantha Rupasinghe from the Nova Scotia Agricultural College in Truro compared 3 varieties of Haskap Berry (Borealis, Indigo Gem and Tundra) to partridgeberry, blackberry, wild blueberry, strawberry, raspberry and red table grape. 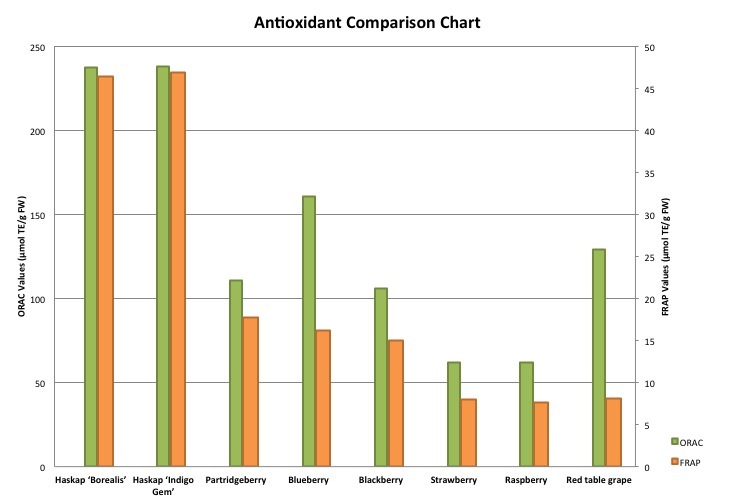 Not content with the standard ORAC test, Dr Rupasinghe carried out a number of different analyses to corroborate his findings, all of whose results confirmed the Haskap varieties to have the highest antioxidant values of all the berries tested. In Dr. Rupasinghe's own words “The results indicated that haskap berries possessed the highest antioxidant capacities and total phenolic contents, specifically total flavonoid among the tested fruits and could be used as a promising fruit source of natural dietary antioxidants”. Haskap berries have great health benefits, vitamin C contents range from 50mg-100mg/100g of the berries, outranking Blueberries. Secondly, they are a high source of antioxidants and other flavonoids such as Rutin, Ferulic acid, Epicatechin, Genistic acid, Protocatechuic acid, Caffeic Acid, Ellagitannins, Quercetin and many others which help fight cancer and other diseases. The antioxidant levels are measured using the ORAC (Oxygen Radical Absorbance Capacity) method. 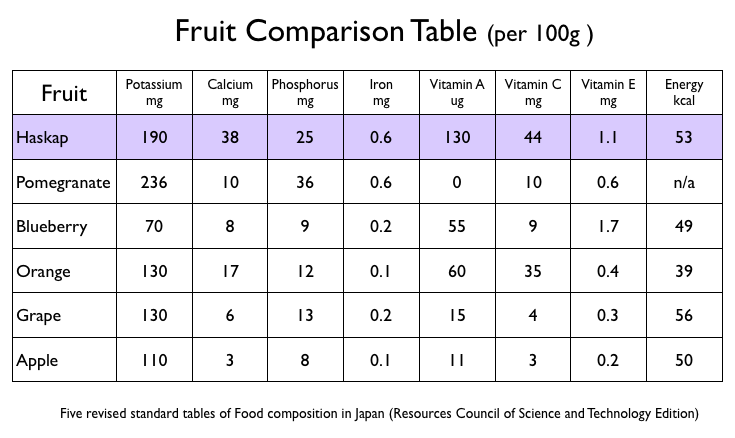 A wide variety of food has been tested using this methodology, with the Haskap Berry being rated very highly in comparison with other berries.